The ability to use live Linq queries right in your UI makes for great demo's, but it doesn't bear a striking resemblance to a real-world, professional application which uses tiers. In traditional n-tier applications, you want to have a strong "separation of concerns" and encapsulate your business layer, your data layer, and your UI layer distinctly. One of the nice things about Linq is that the flexibility is huge. If you want to do live queries in your UI, fine. If you want to encapsulate Linq queries in your data layer, that's fine too. Having said that, the biggest problem I faced when using the RTM for the first time was trying to update an object that had been created by a "different" data contact. I continually ran into one of these dreaded exceptions: "System.InvalidOperationException: An entity can only be attached as modified without original state if it declares a version member or does not have an update check policy." The other one was: "An attempt has been made to Attach or Add an entity that is not new, perhaps having been loaded from another DataContext." - Optimistic concurrency based on timestamps or RowVersion numbers. - Optimistic concurrency based on original values of a subset of entity properties. - Optimistic concurrency based on the complete original and modified entities. But they never really gave any concrete example of implementation. So here is a quick example of how to avoid this. Notice the Auto Generated Value and Time Stamp properties are both set to true. This is key. So, the timestamp is taken into account as well so that full Optimistic concurrency is supported. i'm having a problem, always get "Cannot attach an entity that already exists.". I use timestamp as you recomended. in general how come such as task like updating data made so difficult in LINQ. The problem that you're running into is that your example is not the same as the one I've got posted. I'm my example I'm saving an entity that was created with a different data context - hence the need to Attach(). In your example, you're saving an entity that was creating with the already existing data context that you're using. So actually, you have no need to call the Attach() method at all here. Just delete the line of code where you have the Attach() call and then run your code again - it should work. one question, what about passing the datacontext as parameter additional to the object you want to change? i tried that works fine even if use multi layer (ui, bl, dal). is that a good way to do (passing datacontext)? This is a great example - thanks for posting it. I do have one question, is there any way to update an object without optimistic concurrency (I know that's not a got idea, but we have a scenario where we know the data isn't updated elsewhere). It seem ridiculous to select the record in order to supply the original values!!! If you're trying to build a true n-tier application then I wouldn't recommend passing the data context along with your object. This basically violates the principal of encapsulating your architecture into tiers. Additionally, this wouldn't in a web application where everything is request/response. Darren - Yes it is possible to do this without optimistic concurrency. Revisiting the original exception: "System.InvalidOperationException: An entity can only be attached as modified without original state if it declares a version member or does not have an update check policy." The key here is that you can get around it by not having an "update check policy." So...all you have to do is go to each field in the data context and change the "Update Check" property from "Always" to "Never". This will give you what you're after. System.Data.Linq.ChangeConflictException: Row not found or changed. john mcfetridge - Without seeing your asp.net code, my initial guess would be that you're not persisting the timestamp in your data grid. 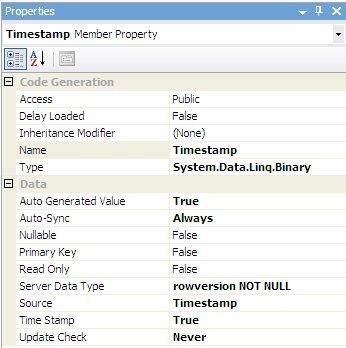 If you put a breakpoint in your ContactUpdate() method, what is the value shown for your Timestamp property? Also, you should check out what SQL is being sent to SQL Server by assigning a writer to your DataContext's Log property (and invaluable debugging technique in Linq). This will show the exact SQL it's trying to run which should pinpoint the reason why it's telling you Row Not Found. u where bang on, the Timestamp is not being preserved across the ObjectDataSource . As soon as I persisted it then the update worked fine. I just did a "dirty" fix to make this work but will find a more elegant solution later . Do you have any idea how the SubmitChanges is using the Timestamp. John - If you assign a writer to the DataContext's Log property, then you'll be able to see for yourself "how" the SubmitChanges() is using the timestamp. Specifically, what you'll see is that the WHERE clause that it is generated is using both your ID (i.e., your primary key) as well as the timestamp column (standard optimistic concurrency). So previously when you were having problems, the ID was fine but the timestamp wasn't and the WHERE clause that was being generated caused the row to not be found. I have created a ContactManager in my business layer and from the client via WCF, I am requesting a Contact using the GetContact method. I am then making a change to one of the contact object's properties and then I call SaveContact (via WCF again) and pass in the contact object. Adam - Did you verify with the debugger that the "contact" object you are sending in to the Attach() method is, in fact, not null? If it is null, then you're problem is in something even before you're getting to your Linq code. Hi Steve, the object itself isn't null. As when I retrieve it to the client, it's properties are accessible and then when I send it back to the DAL to write the changes, the object is also not null. I've tried cloning the object and sending original parameters around so I can use Attach(new, old) but that doesn't appear to work either. Hi Steve, I have resolved the issue. I had Serialization set to none in the dbml. I was manually marking the objects I needed with [DataContractAttribute] and their properties with [DataAttributes]. Essentially an object that was linked by FK wasn't serialized and hence, that was producing a null reference when trying to attach the object to the data context. Cheers. How does this work with tables with Foreign keys? It just comes up with the 'different datacontext' for me. This is a good read on how things work under the hood. However the practical problem is that the LinqSql designer does not support refresh. So for example if I carefully modified many update policies, they would all be erased the minute I renamed a column in the db schema. Correct. Quite frankly, this is one reason why using the designer is not always the best approach. Often I'll use it for the initial code generation but then manipulate the code myself on my own DataContext file. Don't modify the code in the generated code. This is why all linq2sql classes are partial classes and all extension methods are partial methods - you can do all customizations in partial implementations in separate files. I have been trying to perform the attach method with no avail. I come to the same conclusion as Rick Strahl (CLUNQ). I have added a DateTime Propery and marked it is a TimeStamp in the designer. The following code from K Jackobson @ Solid Code illustrates what I am trying to do...With no success. @Rohit - Try setting the UpdateCheck property of your data context to never. Many thanks ! Great example !! Thanks, I have been struggeling with that for 2 days now!! This is the only example that I was able to get it to work. I almost gave up on using LINQ to SQL and was about to give up 2 weeks of learning and all the code that I did. Hope that I do not bump into more Microsoft surprises!! Set UpdateCheck = never for every column in the table and the problem should be resolved. good luck. Thanks a lot ! As I commented the attach() statement in the table of already existing datacontext the code worked. Thank's, I've lost so many hours before finding your solution. super example man! i've been searching for a solution for days now.